Jews and Gypsies in Weimar: Gypsy Dance sessions coming! I am back in Budapest for a few days between sessions at the Weimar Yiddish Music festival. Di Naye K is heading up that way next week to do a concert on July 24th, and then we are providing music for the dance workshops - Klezmer in the morning for Yiddish dance (taught by our own Budapest Klezmer Dancing Queen Sue Foy, Michael Alpert from Brave Old World, and Zev Feldman) and Transylvanian Gypsy dancing in the afternoon with Florin Kodoban, the fiddler from the Palatka band. 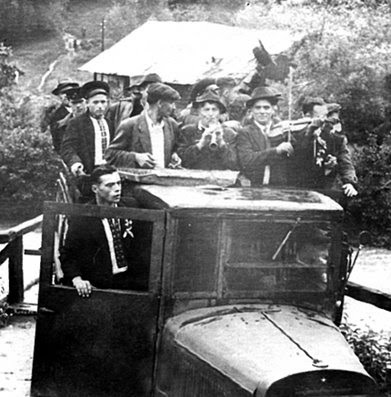 In Palatka, a small village in the Mezőség (or Câmpia Transilvaniei) twenty kilometers east of Cluj, the Kodoban, Radak, and Macsingo families have provided the music for the mixed ethnic populations of the Mezőség region for genersations. Palatka's virtual isolation has allowed it to preserve a particularly rich dance tradtion and an archaic style of fiddle band music, rich in ornamentation, lop-sided rythyms, and a dissonant sense of harmonizing modal melodies against major chords played on the three stringed, flat bridged viola known in Transylvania as the kontra. 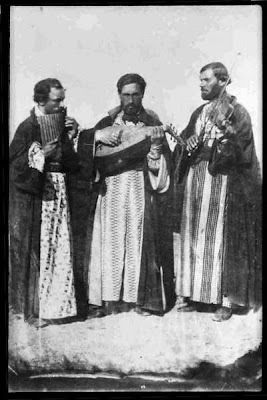 [The black and white photos of the Palatka musicians are from the website of the noted Hungarian photographer and musician Bela Kasa.] Of course, there was always a question about "which Gypsy dance" to which the answer is there is no single Roma dance tradition. 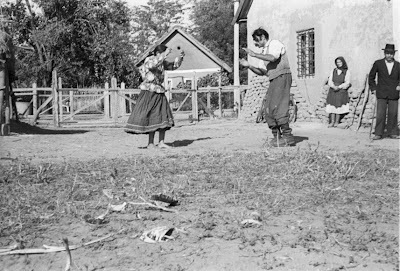 The dances from Transylvania, however, are one of the few that are done to an instrumental music played by Roma for Roma, known as ţiganeşti in Romanian and cigány tanc in Hungarian, or basically, romani khelipe in Romani. One of the main features of Romani dance, in contrast to the non-Gypsy gadjo population, is that the Roma maintain a much stricter separation and definition of gender roles between men and women. The Roma style of dance reflects this: men and women dance in couples but without touching or holding, for the most part. In the Mezőség a "dance cycle" begins with slow dances and can last over a half hour before ending with twenty minutes of fast csardas dances. The Gypsy dance cycles include some couple dances in which the couples are holding each other (such as the slow "lassu ciganytanc") but they then either skip or sit out the middle tempo dances until the final fast dances, during which the Roma men show off in a far more improvisiational manner than the non-Gypsy dancers. 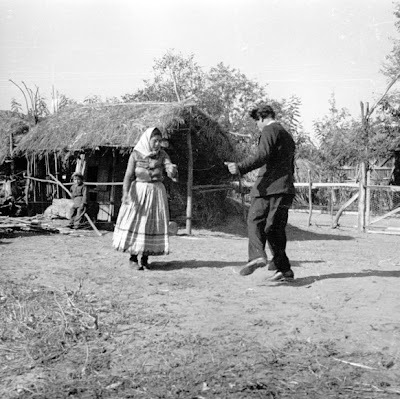 The middle tempo dances done by non-Gypsy peasants usually feature a lot of mixed couple figures that intertwine the dancers bodies - movements which are not considered proper by Romani attitudes towards gender interaction. It should be interesting to teach Roma dance to folk dancers - we are happy to teach women the men's steps and vice versa, but the dancers would never get a chance to use those figures in anyreal-life situation among Roma involving dance. It is a pretty strict rule in Roma society that gender roles are never reversed. 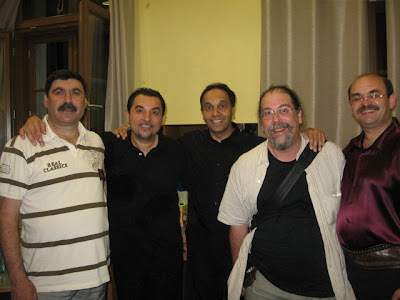 Part of the seminar session at Weimar concerned the interaction of Gypsy and Jewish musicians in eastern Europe. Festival director Alan Bern brought lautar musicians Adam Stinga and Marin Bunea (and Marin Recean, clarinetist) from Chisinau, Moldova and our own Kalman Balogh and Csaba Novak from Budapest for the Roma music project. Kalman brought along several bottles of top shelf Hungarian fruit brandy to liven things up. Look! Why is everybody smiling? My Man in Austin, Mark Rubin, was on hand to handle low notes on tuba and bass. Mark is one of the finest people I know in the Klezmer scene, and also one of the funniest bastards on the face of the planet. He also has a tattoo on his arm of Moses recieving the comandments at Mt. Sinai. Unkosher, yes, but eminently cool. Did I mention that Mark is a Big Hungry Boy? 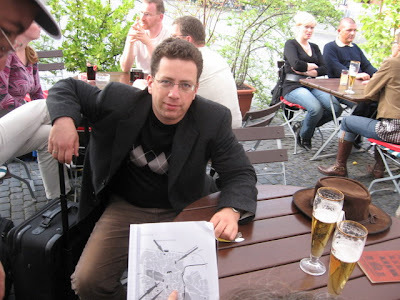 Another old friend from Budapest at Weimar was Claude Cahn, previously of the European Roma rights Center and now working for the Centre on Housing Rights and Evictions in Geneva. Claude spoke to the seminar about Roma Rights in Europe, but most of the time he held a special seminar entitled "Jewish-Roma Babies in Europe: Look at These Hundreds of Pictures of My Baby Daughter Sarah Kali Cahn" Sarah shares her mother Cosmina's beautiful eyes and Romani gracefulness, while from her father she seems to have inherited both intelligence and a whopping huge frigging Jewish shnozzola. 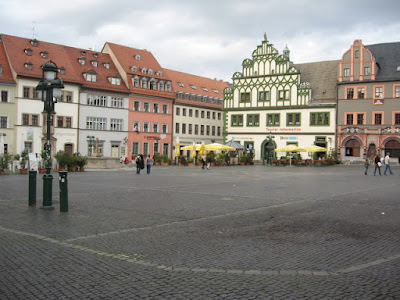 Weimar, as you all know, is where the Germans learned to make money worthless. Nevertheless the town is as cute as a German city can be, and crawling with tourists. It is in East Germany, which means the food is almost as bad as Finnish food (which is pretty hard to compete with, so let's give our Ossie friends an A for effort!) and the service makes Hungarian waiters seem like busy bees. On average, one waits for well over an hour after ordering a meal to get served. During that hour I am usually regaled by Mark Rubin loudly threatening to crush the wait staff to death beneath his massive buttocks. Our accomodation, however, was great: the Hotel Leonardo in Weimar gets my custom whenever I head through town with a wallet stuffed impossibly full of Euros. 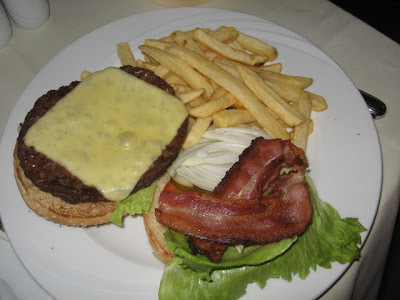 And they do, in fact, make a room service cheeseburger that knocked my socks off. I didn't feel inspired to photograph much of the East German food I encountered. It was mostly brown, and looked like, well, brown stuff. This was probably the first time in my life that I ordered room service... heck, it wasn't even that expensive. And you can't get a good burger in Hungary at all. I salute you, Masterful Burger Chef of the Hotel Leonardo Weimar! 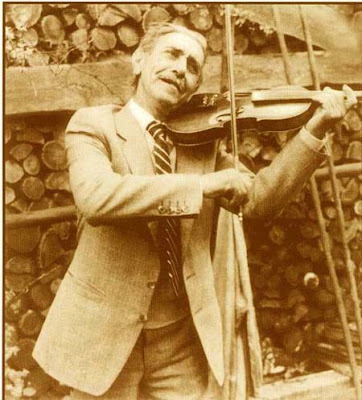 The handsome fiddler seen above is András Horváth from the village of Jankamjitis, in the Szatmár region of eastern Hungary, who passed away in 1997. Before he died he recorded a series of Jewish dances that he had learned from the Markus family band of Jewish musicians in his village before WWII. Uncle András also beat three Fascist Hungarian Arrow Cross thugs completely senseless when they attempted to torture a local Jew in 1944. In his old age he became a Seventh Day Adventist, and he used to call me and go on about how much he loved Jews because they were "Jesus' people." 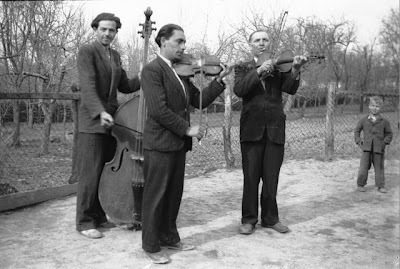 Gypsy Musicians like Uncle András were my link to the sound of pre-war Jewish music, the stuff the record labels like to call "klezmer." Beginning in 1990, I was "apprenticed" to Árus Ferenc, a Gypsy fiddler in Méra, a small village near Cluj, in Transylvania. Feribácsi was another living repository of arcane Jewish tunes, but to learn them, I had to become a musician in his terms first - a primás, a Gypsy lead fiddler. 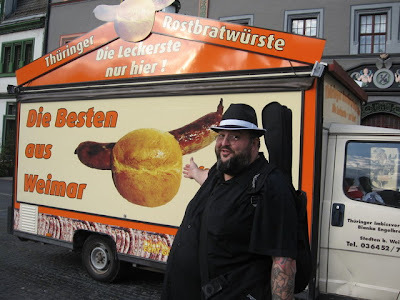 The result of that training is the band I lead today, and this week I am off to, hopefully, pay homage to some of my teachers at the Weimar Summer Yiddish Workshops in Germany. This year director Alan Bern has focused on the role of Jewish and Roma musicians as "the Others" in the history of European music, and Alan has asssembled a number of participants to talk about the history and culture of "music on the perimeters" of the main culture. Next week is the conference/seminar/film component of the summer program. Later Di Nayes will return to Weimar with Florin Kodoban from Palatka to do a concert and a week of dance workshops - playing for the Klezmer dance workshops in the morning, and Transylvanian "Ţiganeşti" Gypsy style dances in the afternoon. I'm looking forward to playing with Florin - I knew his late father, Márton, well and Puma and the boys in the band have been playing with the Palatka band on and off since the 1970s. Jake Shulmen-Ment is planning to be there from NYC. Jake has been turning into the prodigal ace of NY fiddlers who play both klezmer and Transylvanian... so this should be fun. I'm hoping to do a few very early Moldavian lautar songs from the early 1800s mixed up with some older Klezmer stuff. 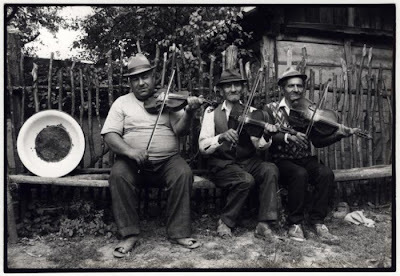 Jewish musicians have been interacting with Gypsy musicians for over three hundred years in East Europe. 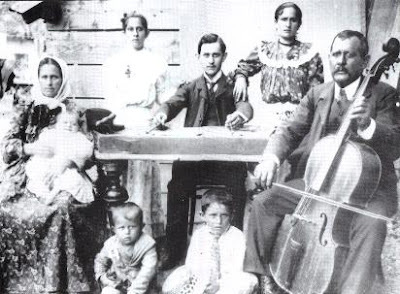 Music - at least popular and wedding music - has traditionally been performed by hereditary dynasties of musicians, whether 'klezmer" families of Jews, or "lautar" (or "bashaldar") familes of Roma. 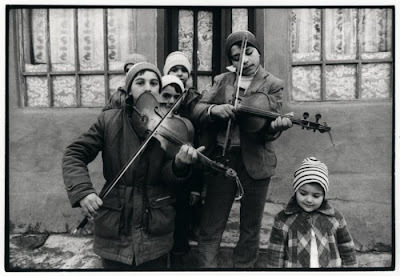 Over the years that I have been collecting Jewish instrumental music in East Europe, my main sources have been Gypsy musicians who had once played for Jews and who maintained a repetoire of Jewish dances. This is mainly because in a small town or village, the local non-Gypsy musicians can usually play the music of their own ethnic group, but were rarely called on as professionals to play the music of any other ethnic group. 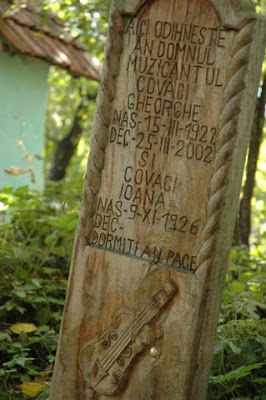 Sadly, that generation is almost gone... One of my best teachers and sources was Gheorghe "Ionnei" Covaci from the vilage of Ieud in Maramures. He passed on in 2002. 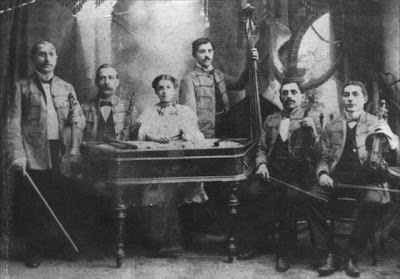 The form of the classic "Gypsy" band - violins, cimbalom, and bass - also formed the basis for many Jewish bands in the era before commercial recordings. In Romania and Poland, the cimbalom - usually in its older, smaller form - was more often identified with Jewish musicians than with Gypsy music. About the only regions where Jews did not actively cooperate with Gypsy musicians was in the Polish and Russian "Pale of Settlement." In these regions, Klezmer families developed a strict system of musicians' guilds, called "tsekh" (similar to the Hungarian céh "guild" and modern cég "company") that governed the business territories and guarded the repetoires of any individual Klezmer band. The tsekh kept competition at bay, and Gypsy bands were relegated to playing for peasant weddings. In the Austro-Hungarian regions and Moldavia, however, the tsekh system was weaker or non-existent. In these areas a Jewish band would often fill its ranks with extra musicians from the local Roma musician communities. Kid fiddlers were cheap. 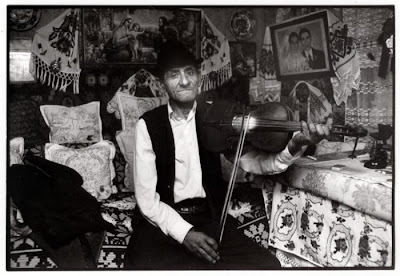 Maramures fiddler Cheorghe Covaci "Cioata" once told me that pre WWII Jewish band leaders used to pay him "with cake." His cousin, Rajna Covaci told me the same thing. (My own band wouldn't take well to that.) 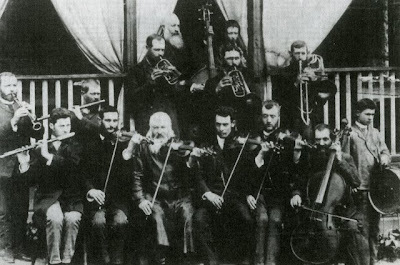 After the Holocaust, in many regions such as Karpatalja, certain Gypsy musicians became the preferred musicians for the Jewish community, as did the Fiddler Manyo Csernovec from Tjaciv, Ukraine, the father of the musicians in today's Tecső Band. In the last couple of years many of the last generation of klezmer musicians who had learned their music as part of a Yiddish upbringing with ties to a fast vanishing "Old Country" have passed on. Paul Pincus, Howie Lees, German Goldenshteyn. Two days ago I heard that Leon Blank, the Polish born Swedish teacher of Jewish dance had passed away. 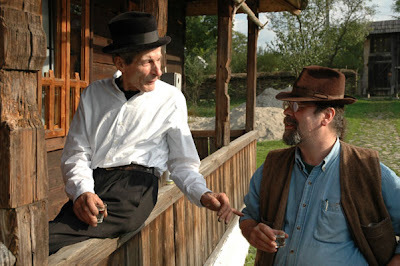 He was a wonderful teacher, a real mentsch, and a great dancer (we worked together last summer in Poland.) While Yiddish culture is still alive in Europe, the sense of loss grows with the passing of each of these living treasures. Living musicians, like Ionu Covaci in Maramures, become all the more valued for the traditions they bear. 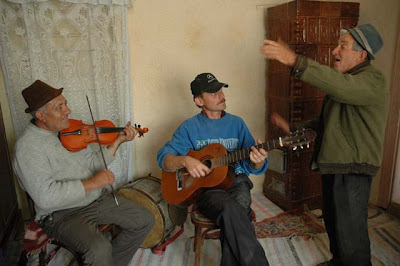 On my last trip collecting music in Maramures, in Romania, I was still able to find Gypsy musicians who knew a repetoire of local Jewish music. Besides Ionu (who locally goes by the nickname "Paganini") there was also Gheorghe Urecche ("The Ear") who learned his tunes from his father, who had been a cross-border smuggler in league with a Jewish musician remembered as "Benzine." Let that be a warning to those named Ben-Zion. Historical folk memory can be merciless. Rijeka: Pleskavica, Cevap, and the Free Republic of Fiume. Rijeka, the main port city for northern Croatia, used to be the Austro-Hungarian seaport known as Fiume, and is a stubbornly non-tourist city fabulously slagged off in almost every guidebook to Croatia ever written. It is a working port and working class metropolis by the sea - if you want beaches, go elsewhere. On the other hand, it is one of the most fascinating and unique destinations that nobody ever goes to on the Croatian coast. Rijeka isn't an easy visit: it doesn't expect people to stay, and accomodations are scarce and pricier than at resorts along the sea. Everything else - food, and the surprisingly lively night life scene - is far cheaper. Who needs night life when you have street life. We caught a park festival featuring guys dressed up as clowns and animals while contestants dived into a deep pool full of sudsy water groping around to pick up bananas and win prizes. Surreal, yes, but in a 1960s Italian film kind of way. Rijeka is famous for its local rock scene: we saw the Rijeka band Let 3 at the A38 a month ago and they just about blew even the most jaded rock snobs away when they finally stripped for their final number - played naked with dog muzzles covering their family jewels and with roses stuck in their behinds. Controlled by the Hapsburgs since 1466, Rijeka came under Hungarian control in 1870. Although the population was primarily Croatian and Italian, a prosperous Hungarian middle class set roots down here in the years before World War 1. In 1912 the future Hungarian communist politician and party leader János Kádár was born in then Rijeka as Giovanni Czermanik. Former New Yiork Mayor Fiorello LaGuardia worked at the U.S. consulate here from 1904 to 1906, allegedly playing for the Rijeka football club while here. Hungarians tend to get nostalgic about the "loss of Fiume" - the only sea port they ever had control of, but after World War I things really started to go pear-shaped. After a brief Italian occupation, in November 1918 an international force of French, British and American troops occupied the city. Italy claimed Rijeka on the fact that Italians were the largest single nationality within the city. Croats made up most of the remainder and were also a majority in the surrounding area, including the neighbouring town of Sušak. On September 10, 1919, the Austro-Hungarian monarchy was dissolved. Two days later a force of Italian nationalist irregulars led by the writer Gabriele d'Annunzio seized control of the city. Eventually Italy and Yugoslavia concluded the Treaty of Rapallo, under which Rijeka/Fiume was to be an independent state, the Free State of Fiume. In 1924, however, Rijeka was annexed by the Italian Fascists to Italy itself, and was only ceded to Yudoslavia in 1947. (Given that I am going to be doing a gig in Gdansk/Sopot, Poland on July 22 with Di Nayes, this makes two former Free Port States I will be visiting this summer. I feel like I ought to annex some territory or something.) Another result is that while Istria feels like a lost bit of the Italian countryside, Rijeka/Fiume feels like nothing so much as a funky, down at the heels Italian port city that just happens to speak Croatian. Rijeka is where you can really sense the meeting of Italian and Balkan cuisine. This isn't a tourist town, and we chose our dinner spot based on the "how many families are happily chowing down here" method of restaurant selection. And they were chowing down at a grill joint offering cevapcici and pljeskavica just next door to a tapas bar highly recommended by our associates at Time Out Travel Guides. The Tapas joint was deserted. The Cevap joint was packed. A difficult decision. 1. Policemen Not Allowed to Play in Picnic Areas. 2. Free Wifi for Members of Marching Bands! 3. Do Not Attempt to Fly the Cylon Base Star by Yourself! We would also like take the time to aknowledge the ugly little shitbird who served as our Hungarian State Railway conductor on the couchette car back to Budapest from Rijeka. As our train was to leave at 20 minutes after midnight on Sunday, Fumie asked the conductor about our seats only to be told that the ticket was for Sunday night, not Saturday night, and no amount of discussion would get him to admit that 00.20 AM actually was on a Sunday. He was pretending not to understand Fumie's (quite fluent) Hungarian when I strolled up. "But you are not on the reservation list!" After calmly conversing with this transparently corrupt retard (my sincere apologies to all the honest and genuinely hard working retards out there...but one bad apple spoils it for everyone) I asked "So how do we solve this problem?" "Well, it can be solved... with a tenner!" 10,000 Forints... about 40 Euros, this after we paid 9 Euros for our valid couchette and knowing that a couchette bed costs only 14 Euros without reservations. I said calmly "rendben" - fine. He led us onto the train and proceeded to warn us about all the dangers - thieves mostly - that awaited us in Zagreb station. In twenty years of riding every cattle car in the Balkans the only actual thieves I ever encountered on a train were within ten kilometers of Budapest. Once on the train I had no intention of coughing up the bribe to this greedy little ogre, but faced by two speakers of Hungarian instead of one he lost face, and soon the little MAV geek popped his misshapened head into the cabin to announce "Oh! I found you on the list of reservations! Must have been looking at the older list!" So no, we will not bother reporting your pathetic attempt at extortion to the already pathetically corrupt MAV management in Hungary. They'll all be on strike in a week or so anyway. Nobody knows why. Nobody cares, either. After spending two days in Pula, we headed north along the Istrian coast by bus. Porec looked inviting - a beautiful Venetian old town occupying a small peninsula jutting into the Adriatic, but we were warned it was something of a tourist magnet, which in these parts means crowds of aging fat Teutons and restaurants offering Bavarian sausages. We had a three hour layover to change buses, which was just about enough for Porec' main sites: the old town and the amazing Euphrasian Basilica. Begun in the 4th century, the Euphrasian Basicilica was completed during the sixth century, making it one seriously old bit of European real estate. I have a soft spot for far flung bits of Byzantium, the remnants of late Roman era municipal spending projects that were just as often lost to some horde of Ostrogoths or Avars as soon as they were completed. The interior is remarkably well preserved, earning it a spot on the Unesco World Heritage list. You can see the old town of Porec in an hour's stroll... but it was hot and we had a bus to catch. At any cafe or bar, you can order lemonade, which usually comes unsweetened, and is just the thing for a hot afternoon waiting for the bus. Just about every bakery offers burek, the Ottoman pan-Balkan savory pastry that is our breakfast of choice. Meat or cheese, burek is cheap and fast and damn good. Most Croatian towns have an immigrant community of Kosovo Albanians or Macedonian Turks who specialize in baking bureks. Budapest actually now has two burek bakeries run by a Croatian family who fled from Subotica in serbia after the Yugoslav civil wars. We had heard good things about Novigrad, a small fishing town on the coast just south of Umag. Novigrad is a bit off the beaten path, but it gets enough tourist traffic in the summer to support restaurants and seaside bars without the feeling that the town has surrendered its soul to the summering hordes. After arriving at the bus station, we checked with a private tourist office next door, and soon 50 Euros got us a beautiful private apartment twenty meters away from the sea. Air conditioning! Kitchen! Satelite TV! Croatia regulates its tourist business carefully, so you can trust these apartment rentals for quality - the rate per person comes to the same as a dorm bed in a youth hostel. No contest... Now, I am not the beachiest person on the block, but to be honest, the Istrian coast has pretty but uninviting beaches... rocky, stony, bring a pair of rubber beach shoes. At Novigrad, at least, the beach has a series of stone approaches and child friendly inner inlets protected from the open sea. And nobody is ever far from a beer. I had my first beer in five months here... and probably my last beer for another five months. Actually, I dropped my low-carb diet while in Istria and was surprised that I didn't blow up like a puffer fish in response to eating pasta and pizza after months of going without. I mean, how can you say no to a seafood risotto like this? As far as restaurant dining is concerned, Istria is definately a dialect of Italian cuisine, and the Adriatic this far north is known for its slimey crawly sea bugs. Grilled sardines are an affordable specialty, but almost any other scaled fish will send you to a bank officer before the waitress arrives. The Adriatic, indeed, the entire Mediterranean sea, is slowly being fished out and supplies of white-fleshed fish are at an expensive premium. Seafood, however, is within reach of the average eater, perhaps in a risotto... Or in a pasta dish, as in this seafood tagliatelle for two (20 Euros for a portion for two) at the Torci 18 Restaurant and (amazingly inexpensive) Hotel, which is open only for a few months a year during the tourist season. The owners started the meal by serving us a basket of bread with a small bowl of bright green olive oil for dipping. check out the olive oil in the pasta sauce. This oil has been rated one of the world's top 100 olive oils and comes from 1000 trees in the family's own orchard. the trees themselves were transplanted cultivars from Lecce, in southern Italy, but in Istria's different soils and climate they produced lovely, rich flavored oil that could almost be a meal in itself. The next day I went to the farmer's market and bought a liter to take home. We followed this with a plate of fried squid. Kalamari are always plentiful and are usually grilled and doused with olive oil, or fried in a light coating of flour. The Croatian coast is a paradise for cephalopod lovers... octopus salads, cuttlefish risotto, or squids are on just about every menu. Apparently, the BBC says that squids are now the one species which is the most prevalent biomass of any living critter on earth. And they only live for 180 days. And they can comunicate by varying their skin color patterns and thus show signs of intelligence. And man, they taste gooood.... And then to the town square, where the cafes were all set up with wide screen televisions to watch the semi-finals of the European Cup soccer matches.